First Line: A good day at work typically left Faye Longchamp covered in sweat, rain, dust, dirt, or mud, depending on weather conditions. Archaeologist Faye Longchamp can't believe her good fortune: she's being paid to excavate a site that once belonged to her family-- something she would've done for free. But all that good fortune turns to tragedy when the dear friend who's funding the dig is found murdered by intruders who left him to die amongst the remains of Faye's artifacts. Even a grief-stricken Faye can see that something's not right about her friend's death. The safe in the house is untouched, and everything of any real value has been left behind. The only thing Faye can think of is that the intruders were aware of the existence of the fabulous emerald that Faye had found that evening. With the blessing of the local police, Faye begins to track down the history of the mysterious emerald. How is her work connected to her friend's death, and how long will it take for the killers to come for her? 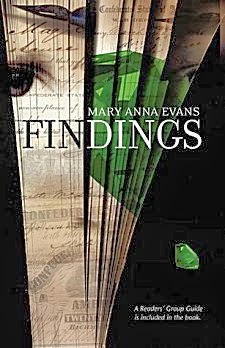 For any crime fiction fan interested in archaeology, Mary Anna Evans' Faye Longchamp series is a treasure trove. Faye runs on too little sleep, so she's able to get dirty doing her job as well as to take time to investigate murders. A topic that's an important part of the story is the depredation of archaeological sites by illegal "pot hunters" who dig up (and ruin) sites, taking away anything of value to sell on eBay or to private buyers. Furthermore, Evans incorporates oral history, letters, diaries, and other things to bring the historical aspects of her books to life. In the case of Findings, readers can follow along on a treasure hunt that ties into the lives and letters of a married couple who lived during the Civil War. To make matters worse, the killers are doing their own research, and they will stop at nothing to get what they want. There are so many layers in this book, but actually Findings is all about love-- Civil War era Jedediah and Viola, Faye's friend Douglass and his wife Emma, police chief Mike and his wife Magda.... Love touches Faye, too, and she has some soul searching to do while she's not doing research or dodging killers. Will she choose life in Atlanta with Ross, or staying at Joyeuse with Joe? If you've read previous books in the series, you'll probably have a choice, but if you're new to these characters, you won't feel lost. Love, treasure, history, and murder set on islands off the coast of Florida. In the hands of Mary Anna Evans, it's a slice of magic. Cathy - I really do like a good blend of investigation, history, and archaeology. And an old love story too? This really sounds like a terrific read. The entire series is one to savor, Margot.